We all love to make cards, don't we? Since I started making my own, I do send more than I used to. However, I still make far more than I send to individuals I know. I've given quite a few gifts of cards usually a bundle with some stamps and perhaps and ink pen as a set. The gifts are always appreciated. Also, I'd given a few cards to a local store that passed the cards along to Meals on Wheels recipients. One day when I was checking their website to see if they still took in cards for this purpose, I found some information on Operation Write Home. After checking out their site, I decided to participate. Yesterday, I sent off my 2nd box of cards. 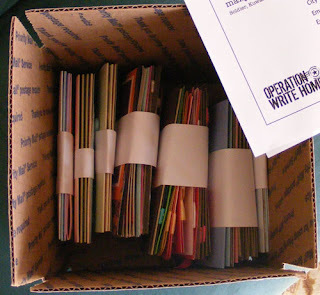 Operation Write Home sends boxes of handmade cards to troops overseas. The members of our military can then select cards to send back to their loved ones at home with their own personal note inside. Cardmakers give the troops a way to stay in touch with family and friends. Both the sender and the recipient at home enjoy the beauty and originality of a handmade card. It is like giving a card twice. For me, this is both a way to support our military and a way to enjoy my hobby. I can't imagine how stressful and lonely it must be to be thousands of miles away from your family and friends in an often inhospitable climate - inhospitable in every sense of the word. Just looking at all those pictures on the news of the desert and mountainsides, you know the troops need more beauty and color in their lives. Check out Operation Write Home at http://www.operationwritehome.org/ Their website explains what type of cards they accept, how to pack them, where to send them (central packers within the US), and what not to send (nothing with glitter!). They have a blog reporting each week on what is sent where. They are very thorough and professional. There is no card store in the middle of the Iraqi desert or the mountains of Afghanistan and even if there were, it wouldn't have unique cards made by loving hands like ours.